As I’ve mentioned before, I have a seriously hard time tossing out perfectly good glass jars. They’re so useful! Unfortunately, they’re not actually useful if they’re just sitting in the closet, alone and forgotten. Luckily for this pretty honey jar, I had a plan for it. As soon as my husband finished it off (he puts a little honey on his protein pancakes each morning), I swooped in and saved it from the trash bin so I could share this tutorial! 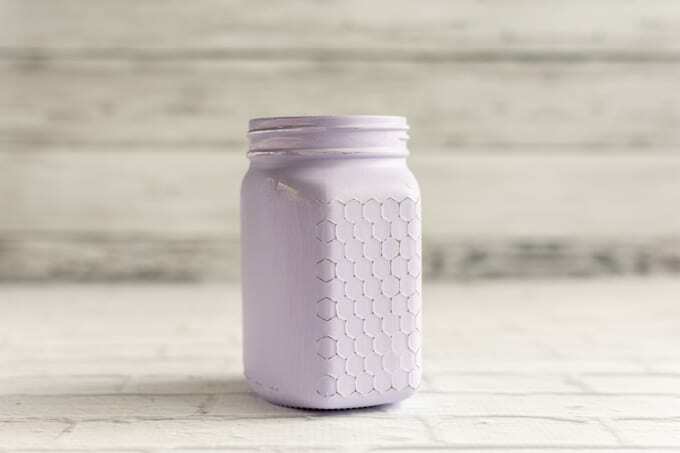 I hope you enjoy the upcycled honey jar organizer I made and can put it to use on a glass jar of your own. 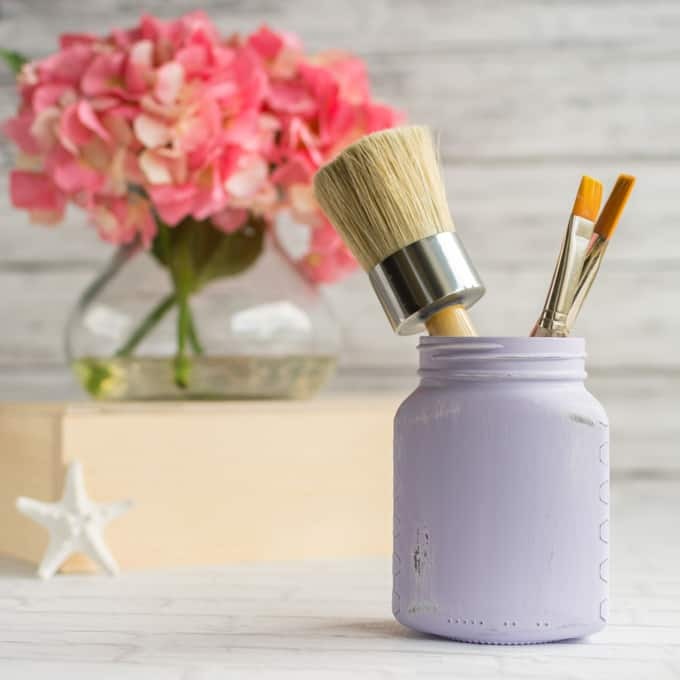 I realize this jar doesn’t look all that different from a zillion other painted jars you’ve seen, but the way I achieved the look is different from any other painted glass jar tutorial I’ve found. It also, in my opinion, works better. 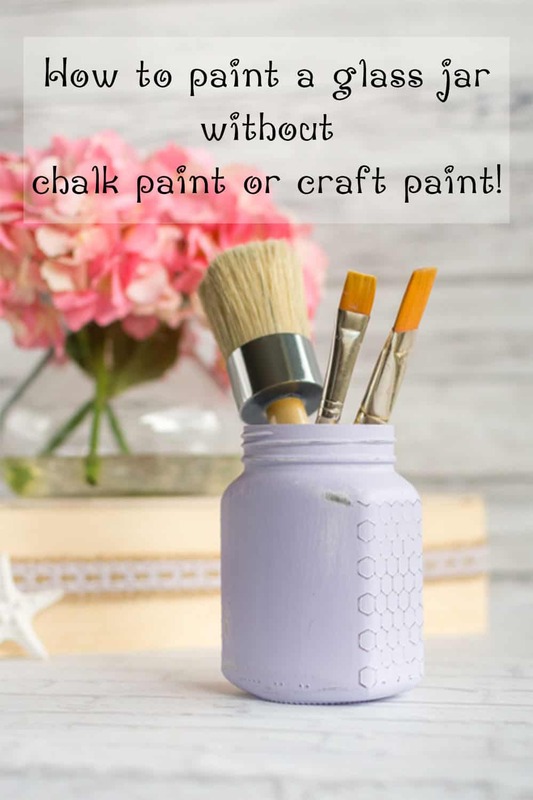 Most ‘how to paint a mason jar’ tutorials tell you to either a) get chalk paint or b) use a whole bunch of acrylic craft paint. I’d love to use chalk paint, but it’s pricey and very difficult to find around here. I’ve tried craft paint on jars and I don’t like the way it looks. The paint is frequently streaky, it has a difficult time adhering to the glass, and it has this plastic-y sheen to it. 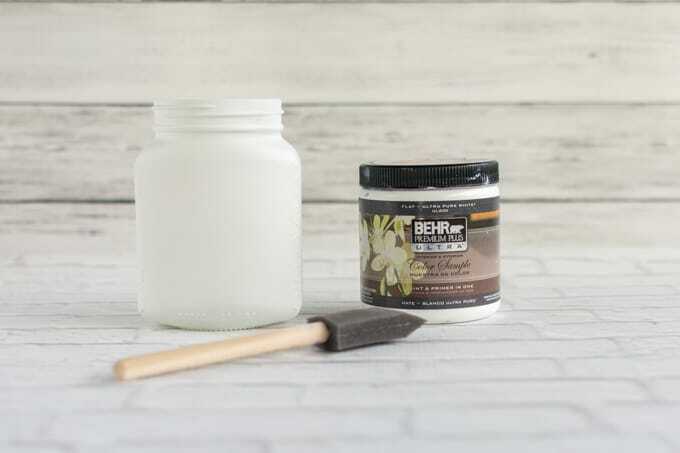 So what should you use to paint your glass jars if you don’t have chalk paint and don’t want to use craft paint? Interior latex paint! Around there, samples of the ‘better’ quality paint at Home Depot actually cost less by volume than craft paint and it doesn’t have that icky plastic shine to it. Small bottles of craft paint cost close to $2 for 2 oz at the local craft store, but a paint sample costs less than $4 for 8 ounces. Definitely a better deal, plus you can pick whatever color you’d like! Latex paint will, of course, also have trouble adhering to glass, so you do need a spray primer. I realize spray painting isn’t everyone’s thing, but it doesn’t matter if you’re not a pro for this project because you’ll be covering it up with additional paint. I can get name-brand spray primer for under $5, so I’m sure it isn’t too expensive on the Mainland! Just make sure you pick up ‘matte’ finish primer and matte, flat, or maybe eggshell finish paint. Sandpaper (I used 100 on the pictured jar but have successfully used grits as coarse as 80 and as ‘fine’ as 120). A coarse nail buffing block also works. To get started, spray prime your jar. I like to place it upside-down on a piece of cardboard (outside!!) and lightly coat the whole jar. A few minutes later, I flip the jar to hit any areas I missed before, typically along the jar’s mouth. Generally, that’s all a jar needs – it doesn’t require multiple coats of primer. You don’t have to meticulously clean the jar with rubbing alcohol ahead of time since you’re applying primer. 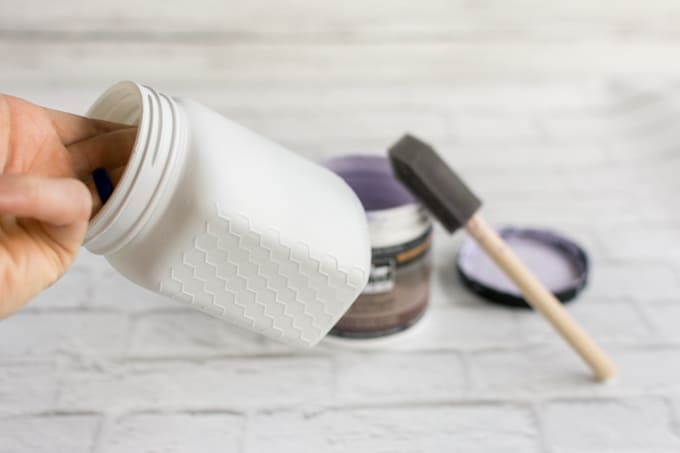 Check your primer can to find out its drying time and, once it’s dry, bring your jar inside and apply your first coat of paint. I find this easiest to do while holding the jar by the mouth, painting the sides, then flipping the jar so it’s once again upside-down so I can paint the bottom. It’s important to not paint the bottom before setting it down or you’ll end up getting paint on your hands or work surface! Apply the paint fairly thickly with a foam or soft bristle brush. Try to make it even and not so thick it will run, but don’t worry about layering on super thin coats to avoid streaking. Latex paint doesn’t typically streak as much as craft paint. Things will even out a bit with later coats, and it’s just totally impossible to achieve a completely smooth coat on the first pass, anyway. Plus, you probably want a few lightly visible brush strokes to keep with the cottage chic appearance! Allow the paint to dry for at least an hour and apply another coat. Allow it to dry again and apply a third, then fourth, coat if needed. It depends on the jar, paint, and my mood, but I apply somewhere between 2-4 coats on each jar I paint. After you’re happy with the jar’s paint, let it dry overnight. Do not try to weather it right away or too much paint will come off! Okay, have you actually waited at least overnight? If so, cut a small square of rough sandpaper and carefully distress the jar by sanding away bits of paint. 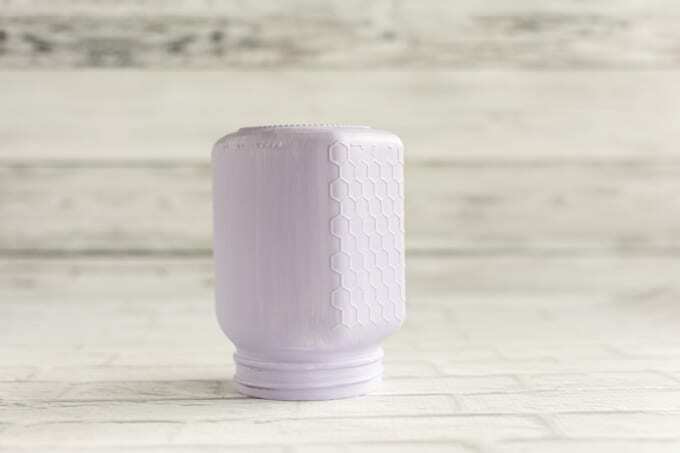 Running the sandpaper over textured areas, like the honeycomb pattern on this jar’s sides, is always a good choice. You may want to wear a mask while sanding the paint. I highly recommend it, but the choice is yours. 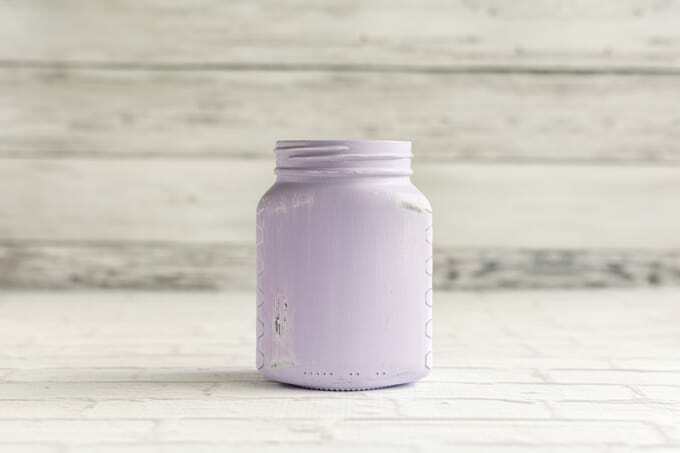 When you’re distressing a jar, try to think about where it would look natural for it to have lost some paint and where natural highlights would be if it weren’t painted. Raised areas, corners, and edges are all natural choices, as are the ridges where the lid screws on. I also like to distress a patch on the upper right and lower left of the “front” and “back” of each jar I distress to help accent its rounded appearance. Just take it easy, distressing a little bit at a time, until you’re happy with your jar’s appearance! Wipe away any paint “dust” with a dry paper towel or soft cloth. Last, take your jar back outside and apply a coat of matte clear sealant, if you’d like. It isn’t mandatory, but it does help protect you newly upcycled jar from wear and tear if you plan to use it as an organizer instead of just a decoration. Ta-da! 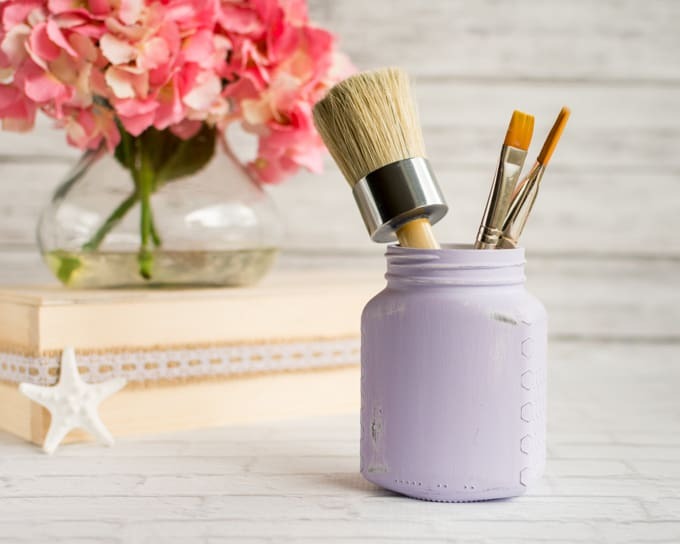 Now you have an upcycled painted jar and you didn’t have to shell out for chalk paint or settle for a plastic-y appearance. 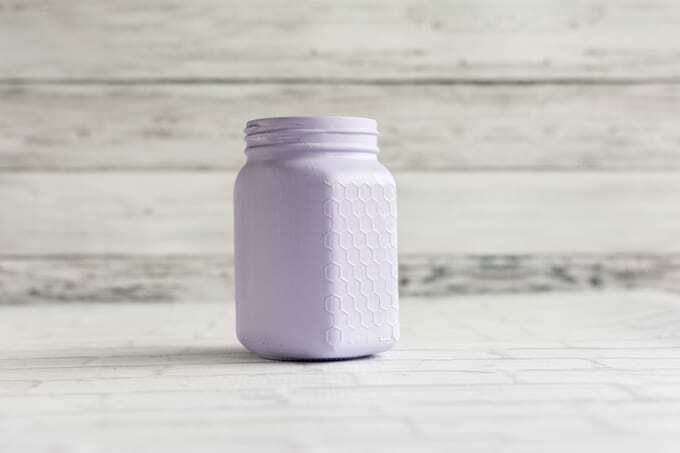 If you have leftover paint from redoing your walls or trim, you can even make custom mason jars that match your decor! 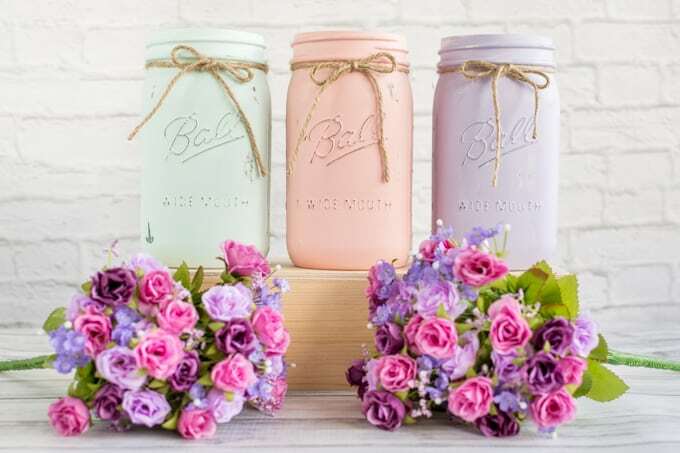 I’m glad the colorful/painted/upcycled jar/glass/vase trend has been around for a while. I’ve enjoyed it enormously and hope it sticks around even longer! How about you? Do you like painted or colorful glass? Do you enjoy decorating with glass? What a great idea and a perfect explanation of the project!